We made our annual trip to Reeger’s Farm to pick out our pumpkins! Not a small task when one considers the number of pumkins that ends up being when one remembers that I have SEVEN kids! We went to mass with Babee and Gramma Hughan and hit the road! We grabbed lunch on the way and then there was nothing keeping these Hough Kids from searching out the perfect pumkins. Here were the kids waiting for the tractor to come around for our ride out to the pumpkin patch. It was a minor miracle that all 7 of them were looking at me AND smiling! Here are DJ and Jake on the hayride. There are lots of hay bales for the kids to climb on and jump off of. … and Noah’s favorite…a giant vat of corn to play in with sand toys. This provided much entertainment for the littlest Houghs. Noah threw a fit when we tried to take him out! But the definite favorite is the hay ride out to the pumpkin patch to pick out our pumkins. The kids were all reminded of the Golden Rule of Pumpkin Picking: If you can’t carry it by yourself, you can’t pick it! DJ was showing off his big muscles by picking the biggest fattest pumpkin! Hannah and her “perfect Princess pumpkin!” Of course! Gia with her “happy cute pumpkin.” Who knew that pumkins could have so much character?! Isaac took a LOOOOOONG time to finally settle on a winner, but he picked a good one. I guess it was worth the wait! Noah loved his “pum.” He wouldn’t let anyone else carry it for him. Seven happy kids with seven perfect pumkins! What a great day! A very tired but very happy mom and dad after a long day! Check out more pictures of our day on my facebook page! Here’s the link! What do Speedracer and Belle have in common? Speedracer and Belle were the stars of the birthday cakes at Isaac and Hannah’s birthday party. 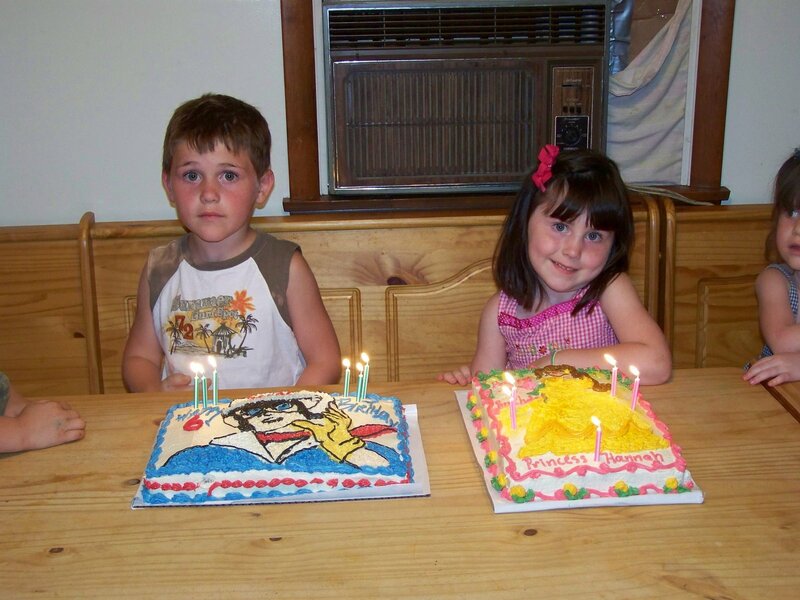 Isaac turned 6 on August 4th and Hannah turned 5 on September 13th. Rather than begging our family to make two trips out here so close together, we have been trying the whole blended party idea. We just pick a day half way between the two birthdays and party! It seems to go pretty well. I don’t think that the kids mind as long as there are cake, ice cream and presents! Brian’s mom Joan has a friend who makes amazingly yummy cakes that asre really cute to boot! Judy’s cakes are becomng famous at our parties. Nobody can turn down a piece of Judy cake. Despite alot of begging, she just won’t give up her icing recipe. Isaac chose a Speedracer cake. It seemed pretty fitting since he does everything at warp speed! Where in the heck did my baby go? Hannah chose Belle from Beauty and the Beast as her cake. It was a beautiful as it was delicious! Again, no major suprise since Hannah is into all things princess! Here is my beautiful 5 year old little girl, showing off her new hair cut! She’s such a poser! Here is Aunt Jess showing her incredible talent of tandem diaper changing! Her girls are only a year apart, so she gets lots of practice! Here is my beautiful Goddaughter Isabella, fully clothed! Isn’t she cute?! The adorable Miss Abby! She’s so sweet! Here is Noah with my mom, Mama and her mom, Mema! Gia and Sissy, what good looking girls! Noah and Pap-pap, he was getting some major snuggling action! We were also thrilled to have Nanny and Poppa Hough there. We are so glad that they have moved back in the area! DJ is looking oh so cool in his uniform! Jake is totally digging soccer! Noah’s favorite part of the soccer game…the snacks! This is why little boys need brothers…. I had a meeting at church and came home to find these pictures and this video clip. My husband looked a little bit queasy, but thankfully he has learned from me and grabbed the camera to document a funny (and possibly a blackmailing opportunity for the future) moment before getting all masculine on me. Here is Hannah with Noah, who is decked out in her new leotard and tutu that Nanna Rose sent her for her birthday. To be honest, I’m shocked that she let him wear it. We are having sharing issues right now. Here he is! Our prima ballerina! Scary , but cute, I know! The funny thing is that he has three big brothers. You can see Isaac trying to put a stop to all of the girly shananigans, but to no avail!